Funeral services will be 11:00 a.m. on Monday, February 11, 2019 at the Roseberry’s Funeral Home in Friendship, Wisconsin. Rev. Richard Eberly will officiate. Interment will be at the Mt. Repose Cemetery, Friendship, Wisconsin. Visitation will be 2 to 5 p.m. on Sunday at Roseberry’s Funeral Home. Clifford O’Dell on November 01, 1946 in Eskdale, West Virginia. They made their home in Chicago, IL. Polly worked for Paymaster for over 20 years. Polly and Clifford retired to Adams, Wisconsin in 1997. Polly enjoyed dancing, singing, gardening, and playing cards. Polly was preceded in death by her parents, Harry and Sarah Foster; husband, Clifford O’Dell; daughter, Diana Redlin; and son, Barry O’Dell. Further survived by many grandchildren, great-grandchildren, and great-great-grandchildren. So sorry for your loss. Mom ( Molly) and aunt Polly were quite a pair, lots of fun memories when we were growing up. Hate that we lived so far away from everyone. Will be praying for you all. I am so sorry for the loss of your mom… I loved her too. Polly had a fun sense of humor! It’s so very hard to lose your parents, but the memories will sustain you. Connie Mug, Gloria and all the rest of the family. My condolences hugs and prayers to all of you. She was always my awesome aunt. She lit up the room every time she entered it. So sweet and a barrel of fun. I’ll never forget her and she loved going to the yard sales with me when she came to visit. Her favorite thing was the Carlsbad Caverns. She would stop every little bit on the trail throw her arms up and say “this is sooo beautiful”And she was beautiful too. And now she is our special Angel. Love to all. 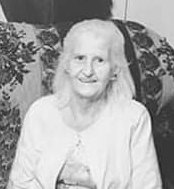 So sorry to hear of Aunt Polly passing.I remember her and Uncle Clifford well,growing up in WV.I know she will be missed by her family and friends.The last time I saw her was when Mother passed,Anna Foster Messer Richards. I have a whatnot she had given mother that mother gave to me. Everytime I see it I thought of your Mother and will always think of her when I see it. My prayers will be with all of you through these trying times.God Bless you all. So very sorry for the loss of your Mother. She was a very special person. Loved the times spent in her presence. God Bless you all, Praying for the peace of God settle on each and everyone. Gloria – My Sympathy in the loss of your Mom. Thoughts and Prayers are with you and the rest of the family. I am so sorry to hear of her passing! She was such a sweet little lady who always had a kind word and beautiful smile. I thought of her often and always fondly. I pray for peace and comfort for her loved ones. God has a special place for her in Heaven.